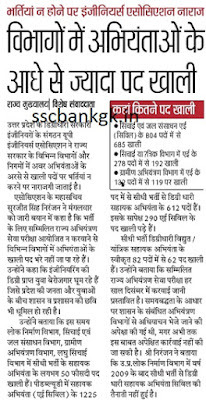 Total Number of Vacancies for UP Jal Sansadhan Assistant Engineer Recruitment 2019: 685 posts is given by latest news paper update. if any type. Probation Period: However, initial appointment will be made for 2 Years/ months, and can be extended based on candidate’s performance. 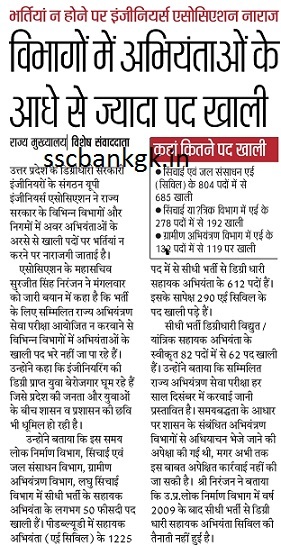 Educational Qualification for UP Irrigation Water Department Recruitment 2019: Graduates with a Mechanical or Chemical engineering degree (BTech/ BE/ MTech/ ME) are encouraged to apply. Selection Process for UP 685 AE Jal Sansadhan Vibhag Recruitment 2019: Written exam will be organized for Group c vacancies. How to apply For UPSSSC Jal Sansadhan AE Vibhag Recruitment 2019:- The interested candidates must fill application form (link given below) before closing date.